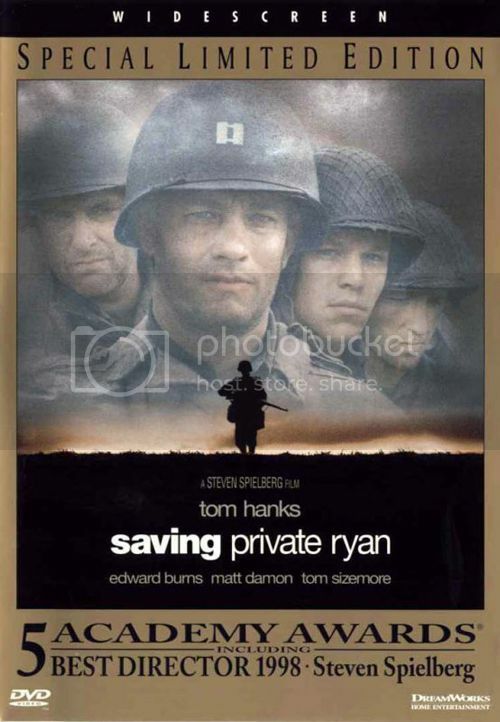 Buy, Rent or Skip Saving Private Ryan (1998)? It's Memorial Day today and that means it's time for my annual WWII Marathon. I usually watch Band Of Brothers whenever I am at home on Memorial Day, but I'm swamped with so many other things right now that I don't have the time necessary to watch a 10-Hour marathon. So, what's the next best thing? Saving Private Ryan of course. For me, no matter how many times I have seen this over the years, it still packs an emotional wallop, be it the gruesome battle scenes are the small quite scenes of reflection. I seem to find something new every time I watch this. This time, it was seeing certain 'background' actors that I never really noticed before, but have since gone on to other high profile gigs. When you mention Saving Private Ryan, you ultimately talk about the opening 30 minutes of the movie that is both exhilarating and terrifying. I can't imagine what it was like on Normandy Beach, but Steven Spielberg did such an amazing job blocking out the scenes, that you are getting as close to the real things as you are ever going to get. Also, using a hand held camera was a stroke of genius to drive home the point of being completely surrounded by chaos and making the viewer in part fell completely disoriented in the middle of gunfire. Also great was the final showdown at the end, which in my eyes is one of the best filmed war scene of all time. As great as those scenes are, that's not what I take away from the movie. It's the scenes that force you to take a look at what war is and the damage and toll it takes on the soldiers. One in particular that I always find to be heartbreaking is the scene with Giovanni Ribisi and him crying out for his "mama", knowing full well that he is dying and can't be saved. If that scene doesn't leave a mark on you in some way, I don't know what will. Another powerful scene of course is the one with Adam Goldberg and the Nazi in their 'knife' fight to the end. The other scene that I really like (and not dark and gloomy) is when Matt Damon as Ryan tells his 'Barn Story' about his brothers to Tom Hank's character. I just totally buy into the fact that really happened to Damon because of the way he tells and sells the story. Amazing job by everyone involved with the film. Spielberg and John Williams aced this one. But it's the cast that really makes this fly by. Tom Hanks, Tom Sizemore, Ed Burns, Matt Damon, Barry Pepper, Jeremy Davies, Vin Diesel, Adam Goldberg and Giovanni Ribisi is just the tip of the iceberg. Tons of cameos can be found throughout the film: Ted Danson, Dennis Farina, Paul Giamatti, Nathan Fillion and Bryan Cranston add to what truly is a great movie from start to finish. I give this one a 'Must-Buy' if you have never seen this one before. I'm just glad that I was able to share the movie with my Grandpa before he passed away, as he himself fought in WWII. He had been wanting to see the movie for a while. I didn't know if I should let him watch it because it would hit a nerve. It did. But he was also glad he got to see it and totally loved what the movie represented. Whenever I watch the movie, I think of him the entire time. I've never seen this. I typically can't get past the first 15 minutes. I try... but war movies... I'm not a fan of.